Neoastra DGCUW is a fluorescent magnetic ink for use in MPI and was formulated to give defined indications using the highest grade of magnetic particles which were selected for their response to very low magnetic fields and for low coercivity. Neoastra DGCUW should be viewed using a UV light with a surface intensity exceeding 1000μW/cm2 with the benefit of allowing moderate ambient light. Anecdotally it has been demonstrated that defects can be found with up to 500 Lux of ambient light present. However to comply with BS EN 9934-2:2015 levels must be restricted to 20 Lux. 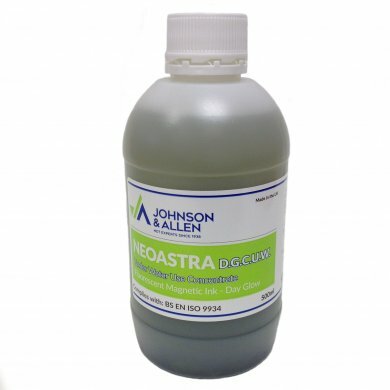 Neoastra DGCUW is a water based concentrate formulated especially for under water use. The concentrate should first be diluted with water in a ratio of 10:1 and placed inside a submersible ink applicator. The ink should then be flooded over the test surface while the magnetic field is held - During both application and inspection to avoiding washing off indications. Neoastra DGCUW it is not classified as hazardous after dilution.